The main brush sweeps debris from dust and sand to small rocks and paper, while the retractable side brush cleans edges and corners. At the same time, a high volume vacuum fan pulls airborne dust particles through the patented Perma-Filter trapping micron-sized particles in the 72 sq ft (6.9 sq m) disposable filter. Hydraulically driven brushes and a powerful filter system, which includes a Perma-Filter, help the 6400 ride onm sweeper sweep the dirtiest, dustiest environments. A T-beam frame construction and corrosion resistant hopper and shroud ensure the 6400 ride on sweeper lasts long after other sweepers have broken down. Maintenance is quick and easy with no-tool brush change and InstantAccess no-tool removable panel filter. The floating, non-corrosive hopper, with replaceable steel skidplate, dumps at heights up to 5 feet (1525 mm) high. Operator comfort is maximised with easy-to-understand displays, power steering, adjustable foot pedal and noise levels as low as 78 dBa. Flexibility – Choose from six power platforms to meet your facility’s needs. 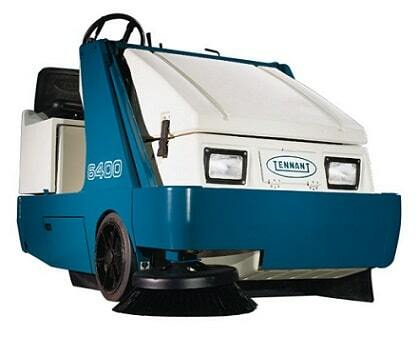 Simplicity – Auto-on brushes and simple controls mean almost anyone can operate the 6400 ride on sweeper. Productivity – The 6400 ride on sweeper sweeps up to 132,000 square feet per hour (12,300 sq m). Power steering and clear sightlines help operator turn the tightest corners and manoeuvre in the most congested areas. Operator comfort is maximised with easy-to-understand displays, adjustable foot pedal and noise levels as low as 78 dBa. Air cooled/liquid cooled gas, LP and even diesel (liquid cooled only) means a variety of power platforms to meet your exact needs. T-beam frame construction plus corrosion-resistant hopper and shroud mean the 6400 lasts long. No-tool change and InstantAccess no-tool removable panel filter make for quick and easy inspection and maintenance. Fail safe filter design seals on both sides for long lasting performance.